November 13, 2018, 6:00 p.m. In the past several years, there have been a number of high-profile instances of police brutality against black Americans. According to new data from YouGov Omnibus, black people living in the US are significantly more likely to believe that police officers are biased against people of color. They’re also more likely to say it’s common for innocent people to be arrested or convicted of a crime, and that that Black Lives Matter movement has been effective. Black Americans are also significantly more likely than the total population to believe that it’s common for innocent people to be arrested and convicted for crimes they didn’t commit. Half (50%) of the total population believes it’s somewhat or very common for innocent people to be arrested for a crime; nearly three-quarters (73%) of black Americans chose the same answers. About four in ten people (42%) overall say it’s common for innocent people to be convicted of a crime, while 67% of black people say it is common. Many Americans have strong opinions about the Black Lives Matter movement, which among other efforts, aims to spread awareness about racial inequality and hold police officers accountable. In 2016, only 33% of the total population had a favorable view of the movement; now, that number has risen to 42%. Black Americans are especially likely (69%) to hold a favorable view of the Black Lives Matter movement. Black Americans (75%) are also more likely than the total population (54%) to say the movement has been effective in spreading awareness about racial inequality. When it comes to holding police accountable, 56% of black people say the movement has been effective, while only 43% of the total population agrees. There are some significant differences between Black Americans and the overall population when it comes to views on police officers and violence in the black community. More than two-thirds (68%) of Black Americans agreed with the statement “Police officers are biased against people of color,” while 43% of the total population agreed. Other statements included “Most people killed by police in the US were probably doing something illegal” (24% of black people and 50% of the total population agreed) and “The media exaggerates stories about black people being killed by police” (26% of black people and 50% of the total population agreed). One statement which most people felt similarly about was “Police departments should hire more black officers.” Slightly more than half (53%) of black people agreed with this statement, as did 48% of the total population. Black people are slightly more likely (29%) to say they’ve had the police called on them than the total population (23%) is. They’re a little less likely to say that they’ve called the police to report something – 49% of Black Americans vs 59% of the total population. 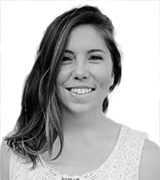 The most significant differences are observed in how safe or unsafe people felt in these interactions. 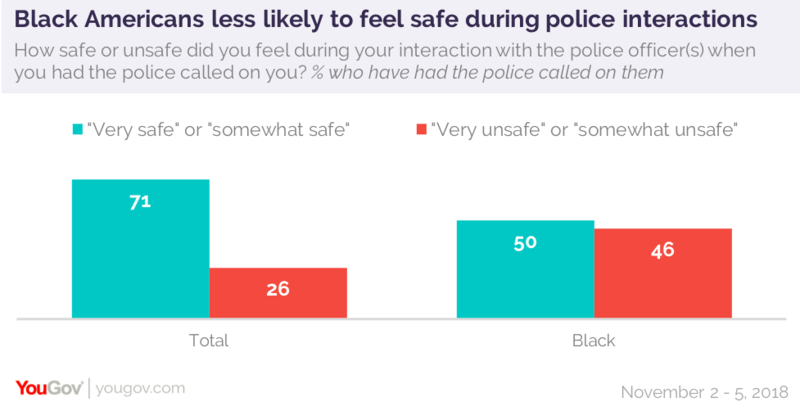 Of those who have had the police called on them, nearly half (46%) of black people say they felt somewhat or very unsafe during the interaction, compared to only 26% of the total population who responded similarly. See full results from the nationally representative survey here and the African-American survey here.